Nanotechnology is expected to be a frontier technology for all sciences due to extensive applications in all fields. Accordingly related research and developments are growing rapidly in this field. Interdisciplinary nature of green chemistry proposes the environmentally benign materials and process. Now a major health issue around the world is cancer caused by an unusual growth of cells,. International Agency for Research on Cancer has reported that approximately 7.6 million deaths arise due to cancer and 12.7 million cancer patients are diagnosed every year. Cancer diagnostics and treatment costs are very high and also have side effects. Researchers have strived to attain a novel therapy and drugs for treatment of cancer. Antibiotics can kill many diseases instigated by some organisms meanwhile nanomaterials can be able to kill 650 kinds of cells, consequently nanomaterials are called as “a Wonder of Medicine”. In past decades, nanomaterials were acting as a good anticancer agent. In recent years, AuNPs were used for anticancer therapy for different kinds of cancers such as Hep2 cell,, breast cancer (MCF-7) and prostate cancer (PC-3). Almost 60% of anticancer agents are reported to be from the plant materials. Many types of respiratory disorders are characterized by inflammatory reaction in air way. In humans, many causative agents are responsible for formation of lung cancer. Most of the lung cancer are carcinomas and 31% of cancers are adenocarcinomas. It is the acronym of human lung adeno carcinoma epithelial cell (A549). In this work, the synthesis of AuNPs was conducted by using Justicia adhatoda (J. adhatoda) (Acanthaceae family) leaf extract. Previous studies reported that the leaf contains phenols, tannins, alkaloids (vasicine, vasicinol, vasicinone, adhavasinone, adhatonine and peganine), anthraquinones, saponins, flavonoids (apigenin, astragalin, kaempferol, quercetin, vitexin), reducing sugars and vitamin C,,. Vasine and vasinone are the major alkaloids in J. adhatoda leaf extract. Chanu and Sarangthem reported the phytochemical components in leaves of J. adhatoda, which contains total carbohydrate (16.1 mg/g), soluble proteins (7.8 mg/g), phenols (32.1 mg/g), flavonoids (37.9 mg/g) and alkaloids (1.09 mg/g). Various phytochemicals such as alkaloids, polyphenols and flavonoids have been proven to fight against various types of human diseases,. Flavonoids can prevent the activities of enzyme which are involved in breaking the carbohydrate into sugar and few flavonoids show cytotoxicity in various cancer cells. The polyphenols can maintain the level of glucose in blood by numerous mechanisms. Phenolic compounds might act as an antioxidant agent by scavenging free radicals. Earlier reports have focused on biological activities of J. adhatoda such as antibacterial, bronchodilator, anti-asthmatic, anti-tubercular, and anti-inflammatory activities,. However, none of them have tested anticancer effect of J. adhatoda mediated gold nanoparticles (AuNPs) on A549 cell line. Therefore, we designed to explore the anticancer efficiency of AuNPs by measuring cytotoxicity through MTT assay and apoptosis by propidium iodide (PI) staining. To the best of our knowledge, this is the pioneer report of cytotoxicity of AuNPs synthesized from J. adhatoda leaf extract against lung cancer (A-549) cell line. Tetrachloroauric acid (HAuCl4·3H2O) Dulbecco’s Modified Eagle’s medium (DMEM), Fetal Bovine Serum, trypsin, streptomycin, MTT, and dimethyl sulfoxide were purchased from Hi Media and Sigma Aldrich. Human lung cancer carcinoma cell lines (A549) were obtained from Cancer Institute (Chennai, Tamilnadu). Fresh leaves of J. adhatoda were collected from agriculture farms in Cumbum valley, at Theni district, Tamilnadu, India. Collected leaves were washed and shade dried for 15 d and ground into coarse powder. Ten mg of coarse powder was taken in a 250 mL beaker along with 120 mL of double distilled water. The mixture was digested for 20 min at 60-70 °C and then the extract was filtered with Whatman No.1 filter paper. This filtrate was called as aqueous extract, and then it was stored in the refrigerator for further experiments. One mL of leaf extract was added to 7 mL of HAuCl4·3H2O solution. Within 20-30 min pink-ruby red color appeared due to reduction of Au3+ ions to Au0. The formation of color was monitored by visual appearance. The effect of temperature on the synthesis of AuNPs was studied by 1 mL leaf extract from J. adhatoda added to 7 mL of HAuCl4·3H2O (1 mM) followed by the reaction in a water bath at 30, 50 and 70 °C. The formation of AuNPs was monitored as a UV-Vis spectrophotometer. The effect pH was experimented by 1 mL leaf extract from J. adhatoda added to 7 mL of HAuCl4·3H2O (1 mM) at different pH (4, 7 and 11). The formation of AuNPs was monitored by UV-Vis spectrophotometer. A UV-Visible spectrophotometer technique is used to ascertain stability and formation of nanoparticles. UV-Vis spectra were recorded using a Perkin-Elmer Lamda-45 spectrophotometer. Scanning Electron Microscope (SEM) and Transmission Electron Microscope (TEM) were performed on Hitachi S-3400N and TEM-JEOL model 1200EX. Fourier Transmission Infrared Spectroscope (FTIR) measurements were carried out using Perkin-Elmer in the range of 400 to 4 000 cm-1 by using KBr pellets. Surface enhanced Raman spectrum measurements (SERS) were analyzed by Nano photon-Raman 11 spectrometer. Lung cancer (A549) cells were grown in DMEM containing 10% fetal bovine serum, penicillin and streptomycin, and subsequently incubated at 37 °C in a 5% CO2. Cultured cells (1 × 105 per well) were seeded into a 96-well plate with 1 mL of DMEM medium. Various concentrations of the AuNPs (20, 40, 60, 80, 100 and 120 μg/mL) were added to each well and incubated for 24, 48 and 72 h at 37 °C in a CO2. Control cells were also maintained without adding AuNPs. After the incubation period, the medium was removed and fresh medium was introduced with 10 μL of MTT solution and incubated for 4 h. The formation of purple colored formazan crystal was dissolved with dimethyl sulfoxide (DMSO), and then spectrophotometric absorbance was measured using an Elisa-Reader at 570 nm. The effect of biosynthesized AuNPs on the proliferation of A549 cells was expressed as percentage of cell viability. The cells were seeded in a six well plate at 1 × 105 cells/well and incubated overnight. Thereafter the cells were maintained in DMEM medium. 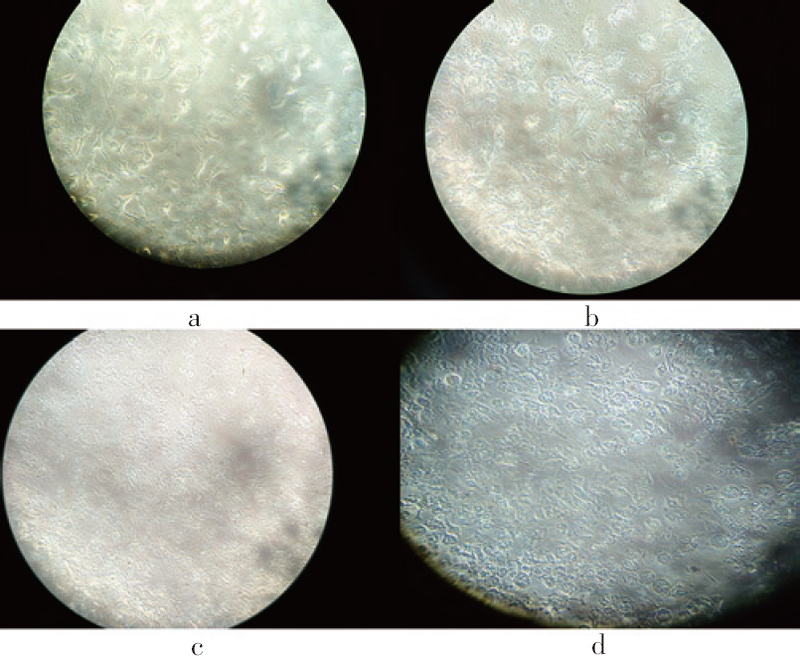 Biosynthesized AuNPs of IC50 (80 μg/mL) were added and then incubated for 24, 48 and 72 h. The cytomorphology of the exposed cells was monitored under fluorescence microscope. A549 cells were seeded into a six well plate at 5 × 104 cells/well. After that when it reached more than 90% confluence, the cells were treated with AuNPs at 80 μg/mL concentration (IC50 value) for 24-72 hours of incubation time. The cells were washed with PBS and CH3OH:CH3COOH (3:1) for 10 min and stained with 50 μg/mL PI for 20 min. Nuclear morphology of apoptotic cells with condensed or fragmented nuclei was observed by fluorescence microscope. The present study was aimed to monitor the contact time of the reaction mixture in synthesis of AuNPs by UV-Visible spectroscopy. The J. adhatoda plant contains alkaloids, flavonoids, glycosides, poly phenolic compounds, reducing sugar etc., Such kind of phytocompounds are beneficial to reducing the metal and also act as a capping agent as well as stabilizing agent. The surface plasmon resonance (SPR) peak of nanoparticles occurred at 547 nm within 25 min, which was steadily increasing with reaction time and without any shift in wavelength [Figure 1]. 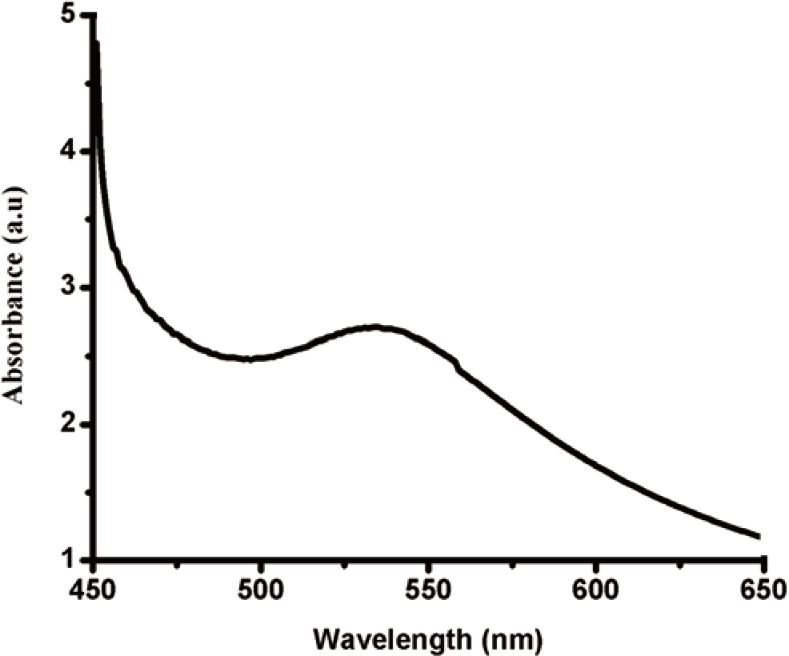 Figure 1: UV-Vis spectra of AuNPs (J. adhatoda leaf extract added with HAuCl4·3H2O). Several factors are responsible for synthesis of AuNPs, amongst them temperature and pH occupy important role in a reaction process. Consequently, the first factor is optimal temperature requisite to synthesis of AuNPs. Thus, the reaction mixtures were prepared and kept at various temperature viz., 30, 50 and 70 °C which were examined under UV-Visible spectrum. 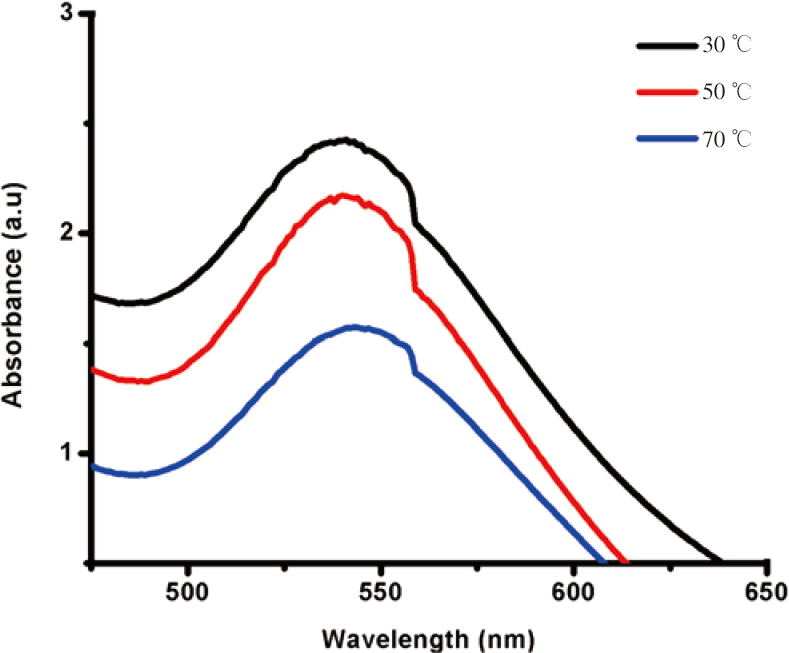 As shown in [Figure 2], with increasing temperature, the SPR band sharpness also increased which indicated temperature was one of the factor for affecting synthesis of AuNPs. When the temperature increased, the rapid color change of mixture was noticed. Figure 2: UV-Vis spectra of AuNPs by the addition of leaf extract with choloroauric acid at different reaction temperatures (30, 50, 70 °C). After that, the another factor is pH which acts as a vital role in the formation of AuNPs. As above mentioned, the experimental set up was maintained in synthesis of nanoparticle with varying pH of the mixture viz., 4, 7 and 11. The rate of AuNPs formation increased with increasing pH, which was visually monitored by immediate dark color and a red shift was observed in UV-Vis. The absorption spectra showed the peaks at 538 nm (pH-4), 541 nm (pH-7) and 545 nm (pH-11). The pH 7 was the most favourable for synthesis of AuNPs [Figure 3]. Figure 3: UV-Vis spectral studies of AuNPs at different pH values. The SEM images of AuNPs synthesized from J. adhatoda leaf extract were shown in [Figure 4] (a-b). SEM photographs described the morphology and distributions of AuNPs. EDAX pattern exhibited the strong signals for AuNPs [Figure 4]c. The optical peak was noted at 2.3 KeV which denoted for the crystalline nano gold due to SPR. Figure 4: SEM images of AuNPs (a–b) from J. adhatoda leaf extract and EDAX of AuNPs (c). TEM analysis discussed the morphology of biosynthesized AuNPs as shown in [Figure 5]. 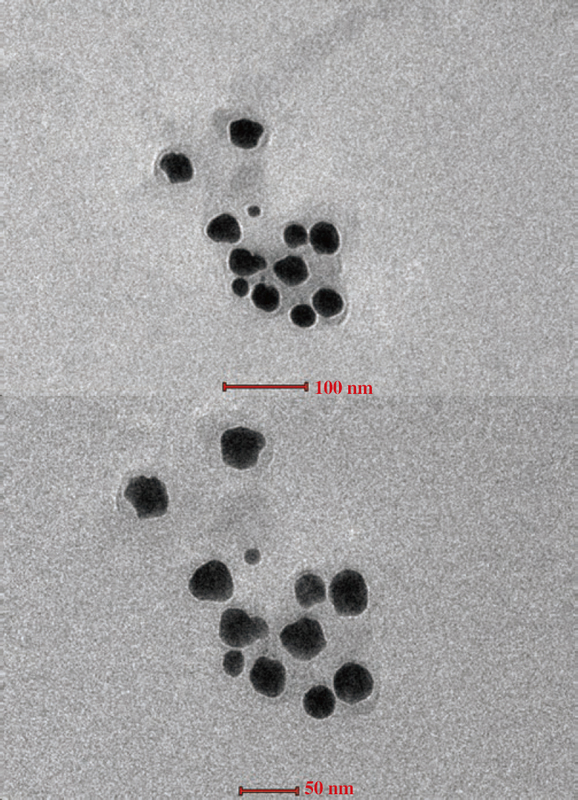 It showed that the TEM images of AuNPs were spherical shape and the average size of the AuNPs was observed at the range of 40.1 nm [Figure 5]. Figure 5: TEM images of AuNPs from J. adhatoda leaf extract. FTIR analysis stands for the molecular absorption and transmission bands or peaks which is due to the vibration frequencies between the bonds of atoms. FTIR was revealed to identify the functional groups of biomolecules that were occupied on the surface of synthesized AuNPs. 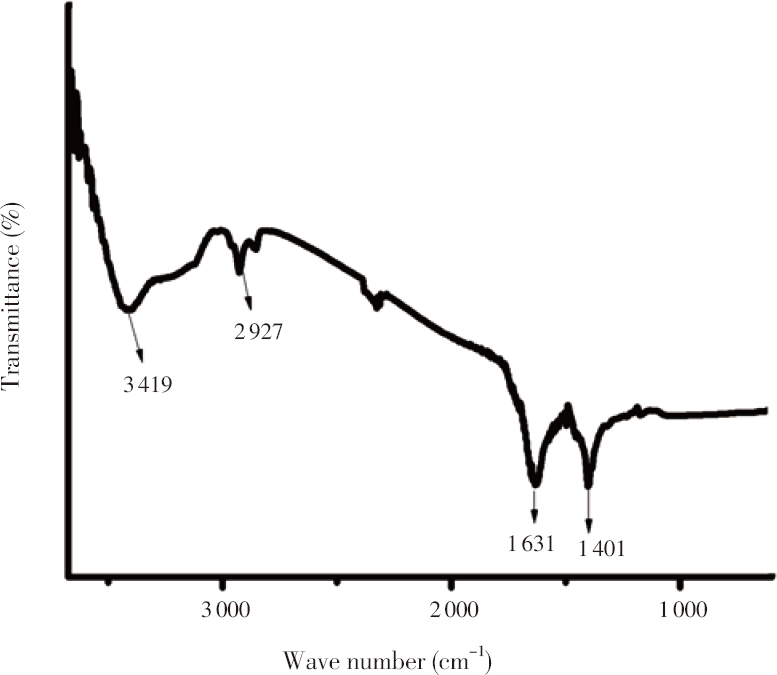 The FTIR analysis of synthesized AuNPs was examined under the peaks at 3 419, 2 927, 1 631 and 1 401 cm-1 [Figure 6]. Figure 6: FTIR analysis of AuNPs from J. adhatoda leaf extract. 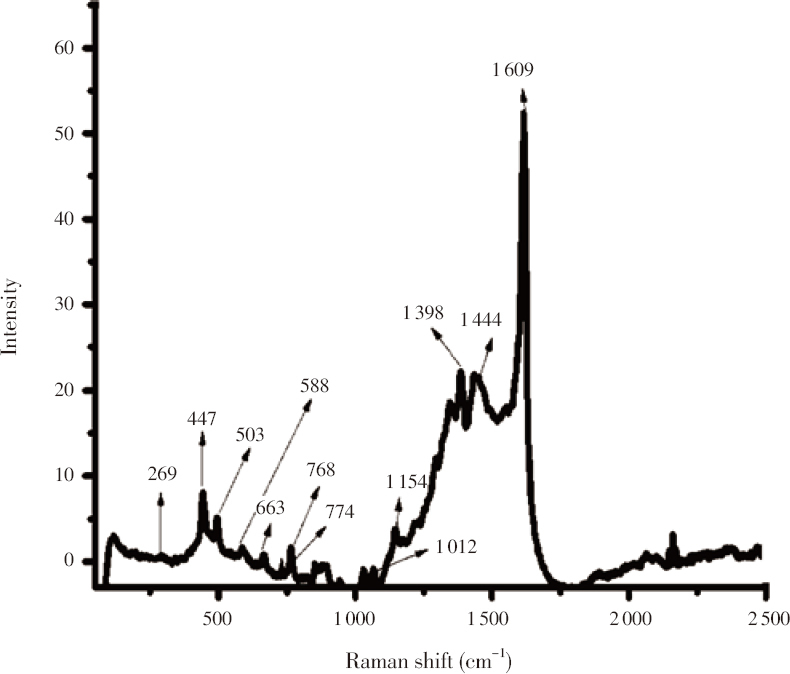 [Figure 7] showed the Raman peak intensities were at 269, 447, 503, 588, 663, 768, 774, 1 012, 1 154, 1 398, 1 444 and 1 609 cm-1. The synthesized AuNPs have shown a strong SERS effect band 447 cm-1 with a shoulder peak at 503 cm-1 due to the skeletal deformation vibration of C-N-C and C-S-C. The small peaks were observed at 774 and 1 012 cm-1 which correspond to C-N-C and C-S-C skeletal deformation as well as N-CH3 stretching. Figure 7: SERS analysis of green synthesized AuNPs using J. adhatoda leaf extract. The cytotoxic effect of AuNPs was determined against A549 cancer cell line. Synthesized AuNPs were added with A549 cell line and later were monitored for their cell viability using the MTT. There was low rate of metabolism which occurred in cells treated by AuNPs compared with untreated cells (control). The viability of cells depended upon the dosage of nanoparticles and incubation period (24-72 h). Significantly, reduction of viability was observed by the concentration of AuNPs and incubation period (20-120 μg/mL & 1-3 days) which was shown in [Figure 8]. Figure 8: In vitro cytotoxicity of AuNPs against A549 cell line. Human lung cancer cells were treated with freshly synthesized AuNPs at the IC50 (80 μg/mL) concentration for 24-72 h incubation period [Figure 9]. Cytomorpholgy of treated cells clearly exhibited the apoptotic mechanism leading to cell death which was observed at 24 h incubation. The apoptotic cells increased with increasing incubation time. Morphological changes including uniform detachment of cells from 6-well plate, inhibition of cell growth, membrane integrity and cell shrinkage were observed [Figure 9]. The results indicated that the biosynthesized AuNPs treated A549 cells underwent cell death compared to untreated cells. Treated cells showed distinct cellular morphological changes. Figure 9: Morphology of control and AuNPs treated A549 cells (a) Control; (b) (IC50: 80 μg/mL) 24 h; (c) 48 h; (d) 72 h.
To confirm the cytotoxic effect encouraged by biosynthesized AuNPs from leaves extract of J. adhatoda, apoptotic changes were monitored. In control cells, negligible number of PI positive cells was observed. In the case of treated cells at 80 μg/mL concentration (IC50) of biosynthesized AuNPs with exposure period of 24-72 h, an increase in the number of PI positive cells was also monitored during increasing incubation period [Figure 10]. The results were shown in [Figure 10]. Nuclear compactness and apoptotic cell changes were identified by the PI staining method. 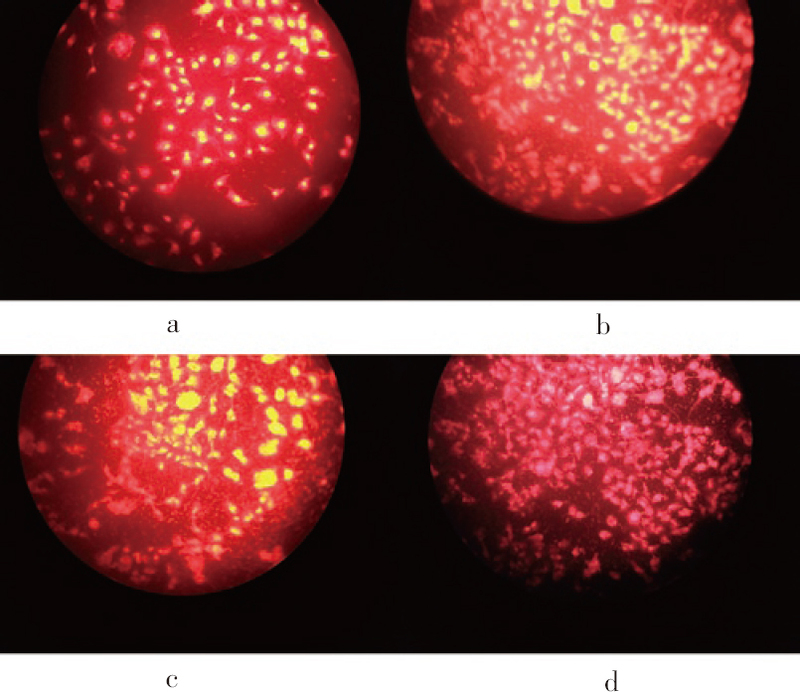 Figure 10: PI staining of A549 cells treated with AuNPs (a) Control; (b) 24 h; (c) 48 h; (d) 72 h.
In recent years, the application of metallic nanoparticle is increasing due to their economy, growing interest of biological field and eco-friendly benign method of their production. Phytochemical compounds of J. adhatoda are the foremost sources for several biological activities. Synthesis of AuNPs using J. adhatoda leaf was conducted in this study, and it was identified by the color changes of mixture from pale yellow to pink-ruby red color. The color of the nano gold is ascribed to the combined oscillation of free electron induced by electromagnetic field that is called as SPR,. Previous reports demonstrated the SPR band of AuNPs appeared almost in this region (500-600 nm), but the position of SPR range may vary which depends on the size as well as shape of the nanoparticles. Lokina et al. also reported that the sharpness of the peak of SPR elevates with the increase of reaction time. The formation of stable aggregation of the AuNPs in a solution or anisotropy nature of particles was pointed out by shoulder peak of SPR. At high temperature, faster rate of the reduction enhances the nucleation rate, utmost number of nanoparticles is formed, thereby stopping the secondary reduction process and providing minimal possibility for particle size-growth,. Interestingly, at low temperature, the particle size is large due to overgrowth of nuclei which is possible to form the anisotropic nature of nanoparticles. With increasing temperature, the SPR band sharpness also increased, the same result was also observed in the Coleus aromaticus leaf. Above 30 °C, SPR peak decreases due to overgrowth of crystal around the nucleus,. Therefore the optimal temperature for AuNPs synthesis was preferred to be 30 °C which is the best result compared with other results,,. 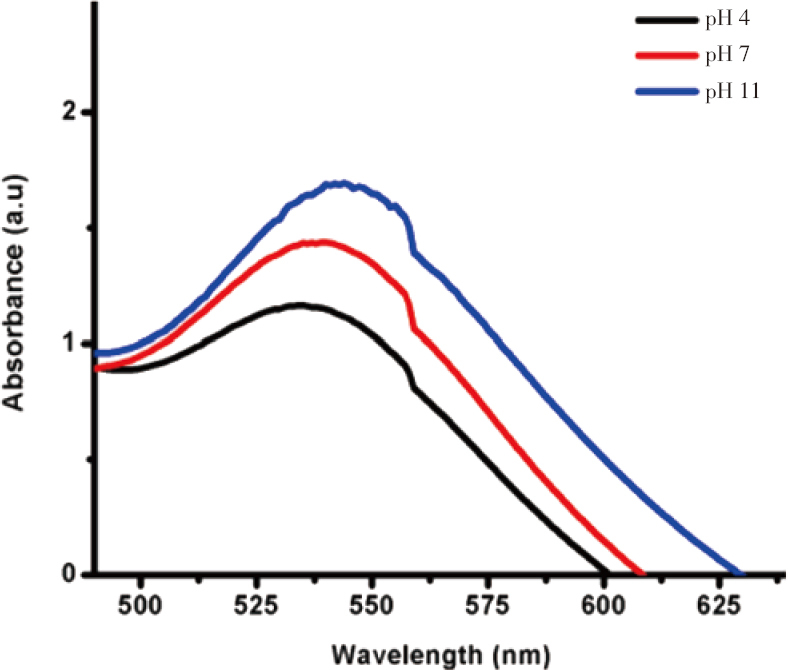 In pH parameter, the absorption band shows the red shift due to localized SPR of nanoparticles. In general, acidic medium suppresses the growth of nano particles but the basic condition boosts the growth of nanoparticles,. At lower pH, larger size of nanoparticle may be possible to form this that is due to over nucleation, besides higher pH, utmost number of functional groups is bound on surface of nanoparticle; as a result, maximum number of nanoparticle is obtained with small size. At lower pH, synthesized AuNPs were bound with -SH group (cysteine), and -NH2 (glutamic acid) groups which is confirmed by FTIR analysis. Verma et al. also reported that the red shift (longer wavelength) of SPR indicates that size of the nanoparticle increases along with increasing pH. The optimal pH for AuNPs synthesis was preferred to be pH 7 which is in agreement with the available literature. SEM and TEM studies revealed spherical shape of AuNPs without aggregation. It was obviously illustrated that a spherical and triangle shape of the nanoparticle was capped with the biomolecules. The capping and stabilization of AuNPs are due to the J. adhatoda leaf extract which contains flavonoids, glycosides and proteins. The broad band at 3 419 cm-1 is due to the O-H stretching vibration. The band at 2 927 cm-1 corresponds to C-H groups. A sharp peak at 1 631 cm-1 is attributed to primary amide bond I in FTIR analysis. FTIR analysis showed that the C=O group of amino acids of proteins, these molecules had strong capability to bind with AuNPs and it also acted as a capping agent for AuNPs. Hence, the capping agents can prevent agglomeration and thereby stabilize the AuNPs. The biological molecules are reducing and stabilization agents of AuNPs. SERS is a very efficient technique to determine the enhanced effect of surface metal nanoparticles which is associated with efficient capping biomolecules. A small peak that appeared at 269 cm-1 due to vibrations between Au0 and Cl, S, N or C confirms that the biomolecules are at the surfaces of AuNPs. Nuntawong et al.. have also reported that the SERS intensity increases with decreasing the concentration of methylene blue. Several Raman bands are found and in some peaks are splitting in SERS. The splitting and shifting of few Raman bands pointed out that the methylene blue molecule is chemisorbed on AuNPs. This study also revealed that various peaks were found in SERS spectrum, such as 1 012 and 1 398 cm-1 which correspond to histidine and cysteine respectively. In general, such kind of protein molecules can bind on the surface of AuNPs. SERS analysis also verified that the protein molecules acted as a capping agent with the AuNPs. The percentage of cell viability decreased by increasing concentration of AuNPs as well as incubation period. The synthesized AuNPs has shown 50% of cell death at 80 μg/mL concentration which is considered as IC50 value, while at 120 μg/mL, concentration of nanoparticle, cell viability reduced to 33% at 24 h. Cell viability became almost 20% for maximum concentration at 72 h. Similar results were observed by Pernodet et al., in AuNPs on dermal fibroblasts. Control cells were shown regular shape and AuNPs treated cells exhibited spherical shape and cell spreading patterns compared to control cells. Biosynthesized AuNPs can travel into the ion channels through cell membranes and interact with DNA molecules, impeding replication and other nuclear works thus suppressing the metabolic activity,,. The PI staining method has shown that plant mediated AuNPs caused cell death which occurred by apoptosis. In conclusion, the AuNps were synthesized from J. adhatoda leaf extract in this study. The UV-Visible spectroscopy, SEM with EDAX, TEM, FTIR and SERS confirmed the monodispersed AuNPs which were capped with protein molecules. The synthesized AuNPs showed a potent anti-proliferation effect on the A549 lung cancer cell. Thus, the present study highlighted the biomedical properties of J. adhatoda mediated synthesis of AuNPs, which could form significant baseline information for development of a new nano-anticancer drug. The authors would like to thank to University of Madras and TNAU for providing facilities. Kanchana A, Balakrishna M. Anticancer effect of saponins isolated from Solanum trilobatum leaf extract and induction of apoptosis in human larynx cancer cell lines. Int J Pharm Pharm Sci 2011; 3(4): 356-364. Unno Y, Shino Y, Kondo F, Igarashi N, Wang G, Shimura R, et al. Oncolytic viral therapy for cervical and ovarian cancer cells by Sindbis virus AR339 strain. Clin Cancer Res 2005; 11(12): 4553-4560. Gunalan S, Sivaraj R, Rajendran V. Green synthesized ZnO nanoparticles against bacterial and fungal pathogens. Prog Nat Sci 2012; 22(6): 693-700. Rosarin FS, Arulmozhi V, Nagarajan S, Mirunalini S. Antiproliferative effect of silver nanoparticles synthesized using amla on Hep2 cell line. Asian Pac J Trop Med 2013; 6(1): 1-10. Devi JR, Thangam EB. Mechanisms of anticancer activity of sulforaphane from Brassica oleracea in HEp-2 human epithelial carcinoma cell line. Asian Pac J Cancer Prev 2012; 13(5): 2095-2100. Ghagane SC, Puranik SI, Kumbar VM, Nerli RB, Jalalpure SS, Hiremath MB, et al. In vitro antioxidant and anticancer activity of Leea indica leaf extracts on human prostate cancer cell lines. Integr Med Res 2017; 6(1): 79-87. Cragg GM, David J. New man plants as a source of anti-cancer agents. J Ethnopharm 2005; 100(1-2): 72-79. Kaplan HG, Malmgren JA, Atwood MK. Triple-negative breast cancer in the elderly: Prognosis and treatment. Breast J 2017; 23(6): 630-637. Maurya S, Singh D. Quantitative analysis of total phenolic content in Adhatoda vasica Nees extracts. Int J PharmTech Res 2010; 2(4): 2403-2406. Singh TP, Singh OM, Singh BH. Adhatoda vasica Nees: Phytochemical and pharmacological profile. Nat Prod J 2011; 1(1): 29-39. Dhankhar S, Kaur R, Ruhil S, Balhara M, Dhankhar S, Chhillar AK. A review on Justicia adhatoda: A potential source of natural medicine. Afr J Plant Sci 2011; 5(11): 620-627. Chanu WS, Sarangthem K. Phytochemical constituents of Justicia adhatoda linn. found in Manipur. Indian J Plant Sci 2014; 3(2): 2319-3824. Murugan R, Parimelazhagan T. Comparative evaluation of different extraction methods for antioxidant and anti-inflammatory properties from Osbeckia parvifolia Arn.-An in vitro approach. J King Saud Univ Sci 2014; 26(4): 267-275. Lokina S, Stephen A, Kaviyarasan V, Arulvasu C, Narayanan V. Cytotoxicity and antimicrobial activities of green synthesized silver nanoparticles. Eur J Med Chem 2014; 76: 256-263. Krishnan V, Kalayanraman R, Fathima G, Sheriff K, Illiyas V, Rather HA. Green synthesis of silver nanoparticles using Piper nigrum concoction and its anticancer activity against MCF-7 and Hep-2 cell lines. World J Pharm Pharamaceutl Sci 2015; 4(4): 723-733. Jayaseelan C, Ramkumar R, Abdulrahuman A, Perumal P. Green synthesis of gold nanoparticles using seed aqueous extract of Abelmoschus esculentus and its antifungal activity. Ind Crop Prod 2013; 45: 423-429. Mulvaney P. Surface plasmon spectroscopy of nanosized metal particles. Langmuir 1996; 1: 788-800. Noruzi M, Zare D, Khoshnevisan K, Davoodi D. Rapid green synthesis of gold nanoparticles using Rosa hybrida petal extract at room temperature. Spectrochim Acta A Mol Biomol Spectrosc 2011; 79(5): 1461-1465. Umamaheswari C, Lakshmanan A, Nagarajan NS. Green synthesis, characterization and catalytic degradation studies of gold nanoparticles against congo red and methyl orange. J Photochem Photobiol B 2018; 178: 33-39. Vanaja M, Rajeshkumar S, Paulkumar K, Gnanajobitha G, Malarkodi C, Annadurai G. Kinetic study on green synthesis of silver nanoparticles using Coleus aromaticus leaf extract. Adv Appl Sci Res 2013; 4(3): 50-55. Fayaz AM, Balaji K, Kalaichelvan PT, Venkatesan R. Fungal based synthesis of silver nanoparticles-An effect of temperature on the size of particles. Colloids Surf B Biointerfaces 2009; 74: 123-126. Veerasamy R, Xin TZ, Gunasagaran S, Xiang TF, Yang EFC, Jeyakumar N, et al. Biosynthesis of silver nanoparticles using mangosteen leaf extract and evaluation of their antimicrobial activities. J Saudi Chem Soc 2011;15:113-120. Mittal AK, Bhaumik J, Kumar S, Banerjee UC. Biosynthesis of silver nanoparticles: Elucidation of prospective mechanism and therapeutic potential. J Colloid Interface Sci 2014; 415: 39-47. Khalil MMH, Ismail EH, EI-Magdoub F. Biosynthesis of Au nanoparticles using olive leaf extract. Arabian J Chem 2012; 5(4): 431-437. Verma B, Ghosh SK, Kundu S, Panigrahi S, Praharaj S, Pande S. Controllable synthesis of silver nanoparticles using Neem leaves and their antimicrobial activity. J Colloid Inteiface Sci 2007; 313: 724-734. Arumai Selvan D, Mahendiran D, Senthil Kumar R, Kalilur Rahiman A. Garlic, green tea and turmeric extracts-mediated green synthesis of silver nanoparticles: Phytochemical, antioxidant and in vitro cytotoxicity studies. J Photochem Photobio B 2018; 180: 243-252. Lahr RH, Vikesland PJ. Surface-enhanced raman spectroscopy (sers) cellular imaging of intracellulary biosynthesized gold nanoparticles. ACS Sustainable Chem Eng 2014; 2(7): 1599-1608. Nuntawong N, Horprathum M, Eiamchai P, Wong-ek K, Patthanasettakul V, Chindaudom P. Surface-enhanced Raman scattering substrate of silver nanoparticles depositing on AAO template fabricated by magnetron sputtering. Vacuum 2010; 84(12): 1415-1418. Xiao GN, Man SQ. Surface-enhanced Raman scattering of methylene blue adsorbed on cap-shaped silver nanoparticles. Chem Phys Lett 2007; 447(4): 305-309. Schwartzberg AM, Grant CD, Wolcott A, Talley CE, Huser TR, Bogomolni R, et al. Unique gold nanoparticle aggregates as a highly active surface-enhanced raman scattering substrate. J Phys Chem B 2004; 108(50): 19191-19197. Pernodet N, Fang XH, Sun Y. Adverse effects of citrate/gold nanoparticles on human dermal fibroblasts. Small 2016; 2(6): 766-773. Rajeshkumar S. Anticancer activity of eco-friendly gold nanoparticles against lung and liver cancer cells. J Genetic Eng Biotechnol 2016; 14: 195-202. Martins D, Frungillo L, Anazzetti MC, Melo PS, Durán N. Green synthesis of gold nanoparticles using seed aqueous extract of Abelmoschus esculentus and its antifungal activity. Ind Crop Prod 2013; 45: 423-429. Manikandan R, Manikandan B, Raman T, Arunagirinathan K, Prabhu NM, Jothi Basu M. Biosynthesis of silver nanoparticles using ethanolic petals extract of Rosa indica and characterization of its antibacterial, anticancer and anti-inflammatory activities. Spectrochim Acta A Mol Biomol Spectrosc 2015; 138: 120-129.